Most of us have experienced the magic that vodka is. But when paired with tomato juice, Tabasco, salt, pepper and lime, it takes the game to a whole new level. 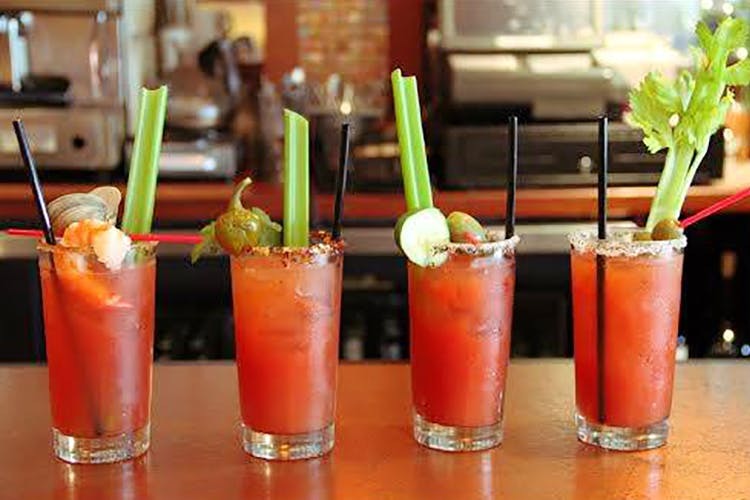 Those of you who are fans of the spicy Bloody Mary, here are some places you should head to for your next drinking session. We recommend going here on a Thursday night when the average age comes down a little. The Bloody Mary is the right amount of vodka and Tabasco. PS: Only members can chill here, so find a friend with a card. Stellar sushi, a gorgeous terrace and a glass of strong Bloody Mary, Town Hall knows how to pamper us. Harry’s likes to play around with their cocktails, and the Bloody Mary is no exception. In addition to the classic Bloody Mary, you can also opt for the Cheesy Mary or the Chatka Mary. If gaining entry into PCO doesn’t already have you feeling special, try their Bloody Mary. Tangy, potent and with just the right kick of spice, it makes for a great way to unwind. The Claridges does a beautiful Sunday brunch in the outdoors, with a pop-up bar that creates one of the best Bloody Mary’s we’ve had in the city. When you go to The Wine Company and seek something non-wine, the Bloody Mary is a good pick. Pair this with the Buffalo Wings with Blue Cheese Dip and your evening’s made. What can spice up the already spicy Bloody Mary further? Yep, we’re talking wasabi. And there’s no better place to indulge in this hot pick than Mamagoto. Delhi Golf Club does a straight-forward Bloody Mary with generous amounts of vodka and Tabasco. Sold? Get hold of your member friend this weekend.